A new phrase has entered the television history books: “Abby’s” was recorded in front of a live outdoor audience. That’s right. 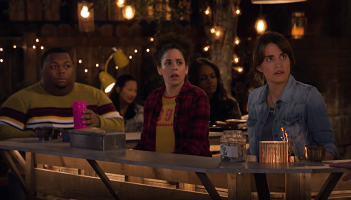 NBC’s new sitcom, premiering this Thursday at 9:30pmET, is shot entirely outside. And that’s easily the hook of the show. Yes, it’s a 21st century version of “Cheers”. 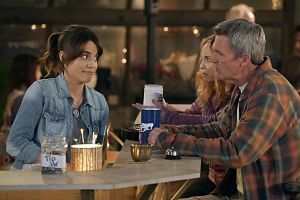 It features the talents of Natalie Morales (“The Grinder”) and Neil Flynn (“The Middle”). And the executive producer is Michael Schur, the man behind “Parks and Recreation”, “Brooklyn Nine-Nine” and “The Good Place”. But if you’re into the world of TV at all – you’ve got to be at least a little curious about how this plays out. A recent New York Times article explores how it works. “Abby’s” is filmed right off the old Wisteria Lane at Universal Studios. The Bob Hope Airport (I’ll always call it that and you can’t stop me) in Burbank is just minutes away, so plane interference during tapings was reportedly very common. That’s one of the things Flynn mentioned when I saw him at the Critics Choice Awards in January. He told me filming the 10 episodes of “Abby’s” was “an interesting experience” with a lot of “unexpected challenges”. According to the NYT, rain wasn’t one of them. But some critters made their presence known, including surprisingly loud crickets. A piece in Variety notes that the sound mixers had a brutal time dealing with them in the editing room. Flynn hopes audiences not only like the show but appreciate the efforts of filming it outdoors. But in order for “Abby’s” to work, it can’t just be the gimmick. The jokes have to land. The characters have to be likable. And it has to feel fresh enough to not be considered a cheap version of the one where everybody knows your name.